These French verbs are confusing for English speakers because they cannot be translated from their English counterpart: to bring and to take. The key is to understand the meanings of the base verbs “porter” and “mener” and the meaning of their prefixes “a-“, “em-“, “ra-” and “rem-“. When it comes to using to Bring and to Take in French, you cannot just translate. The logic is a bit different in French, so you need to think as a French person would, therefore you need to really understand the meanings of the verb, or in this case, the meaning of the “base verbs” porter and mener. The verb “porter” means to carry, so it’s used with inanimate objects. Je porte ma valise – I carry my suitcase. J’emporte mon parapluie en voyage – I’m bringing my umbrella on my trip. J’apporte une bouteille chez mon ami – I’m bringing a bottle to my friend’s house. The verb “mener” means to lead, so it’s used with animate beings: people and animals. Napoléon mène ses armées – Napoleon leads his armies. J’emmène mon bébé au restaurant – I’m bringing my infant to the restaurant. 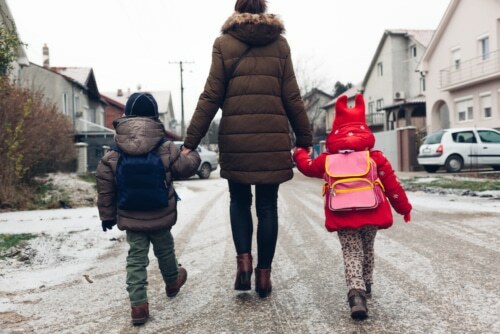 J’amène ma fille à l’école – I’m taking my daughter to school. From porter: apporter, emporter, rapporter and remporter. From mener: amener, emmener, ramener and remmener. Prefix + porter is used with things and inanimate objects. Prefix + mener is used with people and animals. Unfortunately, just like in English with “bring” and “take”, you will hear many mistakes… The verbs based on “mener” tend to be used more and more for people (as they should) AND things. It’s a very common mistake, most people don’t know that rule, so it’s an “accepted” mistake. OR if you are just dropping it/him/her, leaving it/him/her at destination. Then, selecting the correct prefix will translate the notion of bring or take in French. The prefix “A” in French means that you are going to leave the thing/person there. This is the idea behind “amener” and “apporter”. The prefix “Em” in French means you are staying with the thing/person. This is the idea behind “emmener” and “emporter”. – the return of something to its normal place. Frederica, in the Disqus comments says: “In English, we “take” something/someone from here to there, and we “bring” something/someone with us”. So I guess there is a bit of a similarity here. Remporter – to win a competition. Il a remporté la finale. He won the final match. Rapporter – to bring something back, to return something. Je dois rapporter le livre à la bibliothèque. I have to return the book at the library. I’m carrying this book, and then leaving it at the library. Il vend des pizzas à emporter. He sells take-out pizzas. So, although English uses “take” here, you are actually bringing this pizza home with you. The pizza stays with you. Ramener – to take someone to their home/hotel, to give someone a ride home. Tu veux que je te ramène ? Would you like me to give you a ride home? It’s a person, and you are living them there. Porter – to wear + clothing. Je porte une jupe. I am wearing a skirt. Tu t’amènes ? – slang – Are you coming? On se casse, tu t’amènes ? We’re leaving, are you coming with us? – More French slang expressions. It can be a synonym of “apporter” or “emporter”. Unfortunately, translating “prendre” is not always easy since French and English don’t always match and there are many expressions with that very common French verbs. Prendre son pied = idiom, a bit slang but very common. Literally “to take one’s foot”. It means to have a blast. Watch out that in French “prendre quelqu’un” has a sexual meaning, just like it can have in English. Unfortunately, it’s a mistake I hear too often. A student who wants to say “he takes me home” may say “il me prend chez moi” and this has a sexual meaning in French. You should say “il me ramène”.